Although earlier international races were conducted between crews from ships visiting Australia, the first inter colonial racing took until 1833. The early rowing history of Australia can be found in the significant events chapter. Before 1878, various boat races between the Australian Colonies had taken place in four-oared gigs, but in the year 1878 the first boat race in eights, between any of the Colonies, was rowed when Victoria defeated New South Wales. The earliest race recorded between crews of different colonies was conducted on 9 November 1833 when a Sydney crew defeated a Hobart Town crew in whalers. The race was very popular and caused quite a stir. However the earliest Intercolonial amateur boat race with a distinct Intercolonial character was rowed in 1863 in gigs over a three-mile course on the Parramatta River, N.S.W. The N.S.W. four defeated Victoria (time, 19 min. 25 sec.). In this race the crews were of a representative character, and each crew bore the name of its colony. The Victorian crew was made up of members from the Elswick, Melbourne, and Melbourne University Clubs. After the race the differences about the amateur status of oarsmen in the two Colonies became accentuated, Victoria alleging the New South Wales crew was to all intents and purposes watermen, having rowed against watermen and for money prizes. The Victorian definition excluded both sorts of oarsmen from amateur competition. For some years this break continued, preventing competition by crews really representing the Colonies, though club crews frequently raced in Intercolonial matches, the crews being club crews charged more or less with a mission to win the honours for their Colony. In 1870 a race took place at the Balmain Regatta, N.S.W., which the New South Wales crew won against Tasmanian crews, Victoria not being represented. In 1872 a race was rowed over a five-mile course on the Derwent River, Tasmania, the Sydney Rowing Club winning against the Parramatta Rowing Club, some Hobart Club crews, and one from the Barwon Rowing Club, the time for, the course being 36 min. 30 sec. The same year over a 7,000-yard course on Sydney Harbour, two crews from the Sydney Rowing Club beat a Victorian crew (of an Intercolonial character, the crew being composed of members of various clubs, among whom were members of the Civil Service, University, and Melbourne Rowing Clubs). 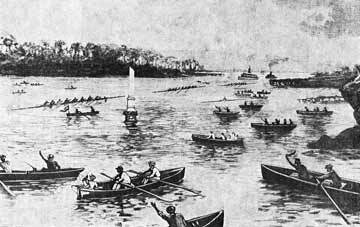 The 1872 regatta was a highlight of early colonial life with some 20,000 spectators watching the event and much press coverage. Next year (1873) Victoria secured the first win with another non-club four (Melbourne, Melbourne University and Warehousemen). The other crews in the race were club crews, comprising two from Ballarat, a Sydney Rowing Club crew, and crews from Hobart Town and Geelong. The race was rowed over about four miles on the Lower Yarra — time, 25 min. 30 sec. This race is generally recognised as the first "official" Intercolonial match. After much debate between Victoria and New South Wales over the amateur definition, a race was organized in 1874 over the Parramatta championship course, 3 miles 300 yards; time, 21 min: 59 sec. New South Wales won easily before a crowd of some 15,000 spectators and much press coverage. For some years after this no such meetings took place until, at the New South Wales Regatta, 1888, a Victorian four, which Mr. George E. Upward stroked, beat New Zealand, New South Wales, and Tasmania in that order. The last of the Intercolonial four-oar races was rowed (in outriggers) on the Parramatta in 1896, over 2.25 miles; Victoria first, New Zealand second, New South Wales third. The 1873 and 1874 gig races were the first races of a character where the crews were representing their respective colonies, the other events before this date being more or less competitions between clubs or combination crews from the various colonies.